Hi! I am a freshman (Class of 2019) and currently a chemistry major. The sciences have always been my main focus so I have little to no experience with archaeology so I cannot wait to explore new fields. I am very excited to learn about how technical and scientific skills can be applied to unravel what happened in the past. Carla Schroer of CHI demonstrates the set up for RTI. “Portrait of a Young Man” is lying on a padded layer below (a very secure) camera on a (very secure) tripod. She is holding the flash unit and stretching out the string that will be our measuring tool. 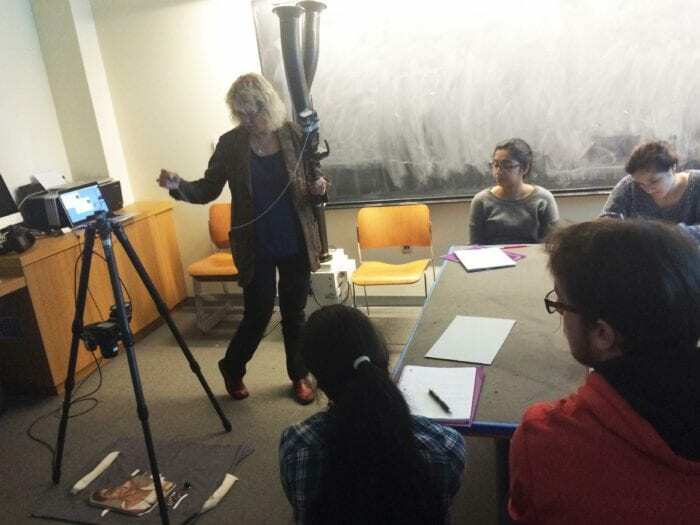 This week Carla Schroer and Marlin Lum of Cultural Heritage Imaging visited our class to teach us about Reflectance Transformation Imaging (RTI). RTI is a computational photographic method that allows us to use digital images to gather information about an object’s surface shape and color, and to combine sets of digital images using mathematical algorithms that reveal surface details that are difficult to see in normal viewing conditions. By taking digital images of the same surface under different lighting conditions and using mathematical algorithms to combine them in a new digital representation, we can start to see details we were unaware of, or that we wanted to study more closely. For this class, we will mainly be using it to look at tool markings, and to see if we can discern what types of tools were used. We might also be able to look and see the order in which the paint layers were applied. There are two different ways to collect RTI data, dome and highlight RTI. Dome RTI requires the object to be photographed inside a specialized dome fitted with known light positions. Instead, we used the highlight method, which involves creating an imaginary dome around the object of interest by moving around it in a choreographed way. For our set up, we placed the portrait on the ground underneath a fixed tripod that held the camera. Different light positions would then be created in a “dome” around the portrait using a flash unit. Two small shiny black spheres were set alongside the portrait; as the flash is moved around the portrait, small white highlights appear on the black spheres. These highlights are what gives this RTI method its name, and also allows the final RTI image to be calculated computationally. In order to maintain the same distance between the object and the flash at all points on the “dome”, a string is tied to the flash unit and gently held in the same spot above the object for all of the digital images taken in a set. It is extremely important that neither the object or camera set up move while the 24-64 images are being captured; if they do, then the pixels will not line up when the images are processed and the RTI image will be blurry in certain views. We then moved on to actually taking pictures of our “Portrait of a Young Man” so that we could develop them into our very own RTI. Looking at our RTI for “Young Man”, we were able to see on a broad scale all kinds of details that we had only seen previously under the microscope or under normal light. By watching the short clip showing the RTI viewer, it becomes clear that by using the different viewing modes and literally moving the light around (using the green button), we can see different features appear and disappear as the light moves. It is very clear that the edges of the face, the eyes and the nose were created with very specific tools, possibly spatulas and also pointed tools, that left their own marks. The broad strokes used to make the background are much more visible here, suggesting a more brush like tool. Using the technology, we were able to identify a textile imprint on the young man’s proper left cheek; the bubbly appearance of the middle of his cheek seems to be where the beeswax was heated at some point after painting, and the weave impression of a textile can be seen from certain light positions. We were also able to discern that his ear, garment, and hair were painted on after the background and the face. However, further examination will be necessary in order to determine whether the face or background came first. Here’s the RTI for “Portrait of a Man” for comparison. Overall, this was a fun and exciting class and I cannot wait to see what additional discoveries we can make through the use of RTI! Great article Morgan! The RTI imaging was really cool because it let us see the whole image close up, instead of having to focus on one tiny part at a time. It was also amazing how different the image looked just by changing the angle of the lighting! The tool marks are so much more clear. I can’t wait to keep playing around with the RTI image to see what else we can find! Getting to use RTI imaging was a real treat! This advanced technique of noninvasive study was very informative in helping determining layering, detail, and brush strokes on the portraits. We are currently using both the RTI imaging software and the microscope to cross examine certain areas of each portrait and we are finding some new information. It is definitely helpful to look at the portrait as a whole with RTI and then go into smaller detail with the microscope. Great blog post Morgan! Nicely done Morgan! RTI imaging is truly amazing. Like Vyshnavi said, it allows us to look at details within greater context. So if something doesn’t quite make sense under the microscope, RTI gives the opportunity to rationalize the details, such as continuous brush stroke. Removing the color also helps a lot determine the surface topography without distraction. Can’t wait to explore more with RTI! Great article Morgan, you’ve put an incredible amount of detail into describing RTI which is super helpful! I’m still amazed at the capabilities of RTI. With Mini and Vyshnavi I was thinking about too was how helpful it is as a tool for corroboration. We might see something under the microscope and then it’s so easy to go pull up the RTI and confirm (or deny) what we are seeing. Not only is RTI relatively fast, but it’s mobile too. I’m just so impressed with it’s applicability in the museum and field setting. RTI and its abilities are truly remarkable. It gave us the ability to see incredible detail without having to use a microscope, which can cause you to lose the idea of the big picture. It was really amazing that RTI combines so many images to create such a detailed picture. Great post Morgan! RTI has, in my opinion, been the most useful technique thus far. I think being able to see the tool marks on our portraits has cleared up some things about which the order in which the parts were painted. I am excited to see what else we can find in the next few weeks with this technology! Great article Morgan! RTI only further evidenced the incredible information that can be gathered about the surface of an object using non-invasive methods that avoid damage. I just consider how many times we have referenced the RTI images since we captured them, and it goes to prove their value. I would have loved to see in person an example of how RTI images can be produced using the dome structure described by Carla Schroer in her presentation. Reflectance transformation imaging provides an incredibly scientific and mathematically minded view of our portraits and I didn’t realize how many mathematical computations were required until Carla Schroer described it and the normals used to calculate the images. I didn’t realize how “distracted” I truly was by the colors and sheen of the portrait until the RTI software allowed for the option to “remove” the color and provide only topographical information, which was incredibly important to help view the portrait from (quite literally) a thousand different lights. Great post Morgan! Using RTI was awesome. It allowed us to see so many details on the portraits. One in particular, a textile imprint on the cheek of the young man, became apparent. This was something that we had been looking at closely for a while and RTI was able to help us try to understand what it is. Also, great job Morgan, you explained RTI really clearly! I am really thankful that we got to see the portraits with the RTI because not only it combined the many images with the raking light together, but applied many filters. I believe this is one of the most important techniques for this research because the exaggeration of surfaces (in sharpness, saturation, or highlighting) reveals the most secrets of the work. It is similar to looking at an actual work but on a screen.